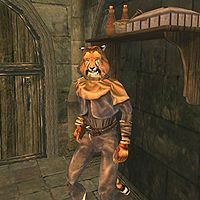 J'Zhirr is a Khajiit agent and employee of the East Empire Company by the docks in Ebonheart. He is involved in a couple of minor quests for the company and also offers medium training in Acrobatics, Light Armor, and Sneak. Dredil's Delivery: A simple note delivery to the East Empire Company in town. The Price List: Find out how the East Empire Company sets its prices. The quests for East Empire Company have no effect on your standing with Bloodmoon's counterpart.